Three thoughts on the Utah Jazz’s 115-108 loss to the Golden State Warriors from Salt Lake Tribune beat writer Andy Larsen. There were stretches of this game where the Jazz played terrifically: essentially, the two middle quarters of the game. During those stretches, the Jazz outscored the Warriors by 14 points, and the Jazz’s offense was flowing. 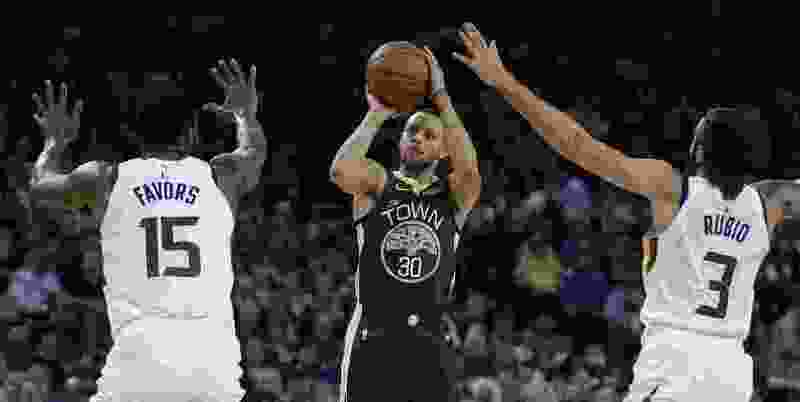 And on the defensive end, for most of the game, they did a really nice job of helping away from the right spots (Cousins, Andre Iguodala, Draymond Green) and towards Kevin Durant, Klay Thompson, and Steph Curry. That those players scored 74 points anyway mostly served to show their talent. But when they slipped, did they ever take advantage. Late in the first half, the Jazz allowed Curry two consecutive open threes, with some lax communication and switching in some clever plays by the Warriors. And then there was the terrifically ugly start and ends to the game, which contained the very worst of the Jazz’s offense: Ricky Rubio and Jae Crowder whiffing on shots, while Donovan Mitchell drove into the traffic that resulted. Consistency is a problem for every team, but the Jazz try to pride themselves on not having the defensive slips we saw. The offensive inconsistency I think most frequently comes down to simple shotmaking. I think people misunderstand what the Warriors are good at right now; they’re no longer the outlier pace-and-space NBA team. Some of this is because the NBA has caught up with them, and some of this is because Kevin Durant, to some extent, changed their identity. Right now, they rank 10th in the NBA in pace, with 101.0 possessions per game. The Utah Jazz, certainly not known as a fast-playing team, rank 12th, at 100.2 possessions per game. Yes, you read that right: the Warriors are only 0.8 possessions per game faster than the Jazz. Likewise with 3-point shooting: the Warriors shoot 37 percent of their shots from 3-point range, good for 11th in the league. The Jazz rank 4th, with 39.3 percent of their shots from deep. But tonight, the Warriors felt like the old Warriors. They took 21 percent of their possessions in transition, and scored them at a 142 offensive rating, both numbers elite. In more traditional numbers, Golden State scored 24 fast break points, and scored 27 points off the 16 Jazz turnovers. And then there was just the sheer quantity of threes attempted: 41. It’s only the tenth time the Warriors have attempted more than 40 threes in a game this season. The math hasn’t been the Warriors’ biggest strength this season, but rather their All-Star talent. If they have both, they’re really tough to beat. Have you ever tried your hand at play-by-play while watching a game? You probably found that it was very hard, and earned a new appreciation for the professional broadcasters who do their jobs well on a night-to-night basis. Even the bad ones, well, they’re pretty good. Turner Sports executives apparently have decided that they want nothing more than to eliminate professional broadcasters by doing their #PlayersOnly broadcasts, where the pros are replaced by recently retired players telling stories during the game. After all, people like Charles Barkley, so they’ll like this, right? In theory, I suppose, it’s innovative and vantage-changing. Donovan Mitchell being called “Dennis Mitchell.” Multiple times. I’m sorry, how does someone broadcasting a game for a national audience not know Donovan Mitchell’s name by now? Raul Neto being called, alternatively, “Neeto” or “Nay-to.” Like the North Atlantic Treaty Organization. Saying Joe Ingles was a Duke player, and saying that they needed to learn how to pronounce his name before the game. I’m glad they learned at least the starter’s names. Sometimes, anyway. Saying “Derrick Favors isn’t known as a rim protector” when he’s currently second in the league in FG percentage against at the rim (49 percent). Flubbing incredibly basic broadcasting things like... introducing advertising reads by saying "There’s supposed to be a promo here!” or continuing to talk and being cut off as the network goes to commercial break. The players talking about cheese for an incredibly inappropriate amount of time. Yes, cheese. This ignores the champagne talk, or Arizona talk, or any number of inane non-basketball topics, none of which were remotely well-discussed. At one point, I think the crew must have been alerted to the negative reception they received, and Thomas kept saying “Hey, this is Players’ Only, the time and score is at the bottom right of your screen.” It’s not that people want the time and score, Isiah. They want to hear about what’s going on. If there’s to be conversation, let’s go with conversation about the game that approaches reality. #PlayersOnly needs to end, Turner. Our national nightmare has gone on long enough.